Concrete Relief taken from Morrison Bridge. 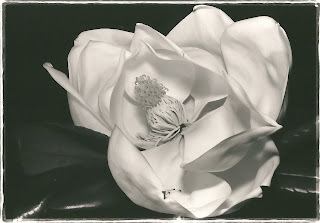 Another Magnolia Flower image. The top one was taken towards the end of the day as it was opened up the bottom one taken at the beginning of the day. The top image was photographed with my Nikon F using 105 bellows lens and shot on Agfa 25. 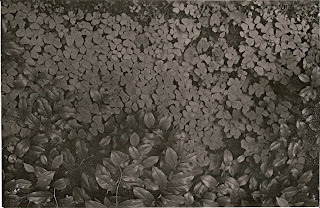 It was printed out on ilford coldtone semi-matte paper. The bottom picture shot with the same camera lens combination was shot with Agfa 100 and printed out on an ilford warmtone gloss paper. 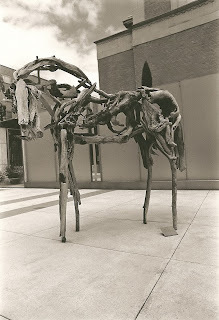 I love this horse sculpture constructed of driftwood that is in the sculpture courtyard at the Museum. This was on the roll of film I accidentally overexposed and needed to pull in development. 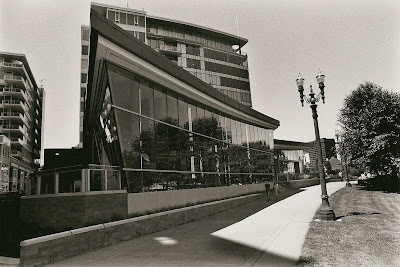 Normal development for agfa 100 in Rodinal 1:50 at 68 farenheit would be 17 minutes I developed it 13 minutes. The film was still a little overexposed I probably could have shortened the development time by another minute but it was still very printable. I made this yesterday using the last of my glossy surface warmtone paper. Cropped but kept the same orientation. Here is an interesting link to a PDF document that is a chapter in an ambitious online series about the History of Photography. 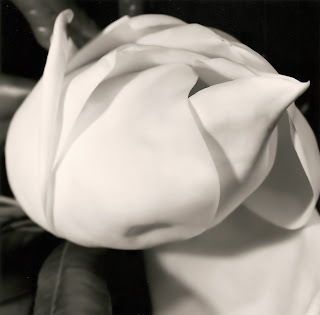 This chapter is on the development of the wet plate collodion process. If you scroll down to page 7 and 8 the author uses a picture of mine to illustrate a print made using the technique. I like the digitally created negative image. 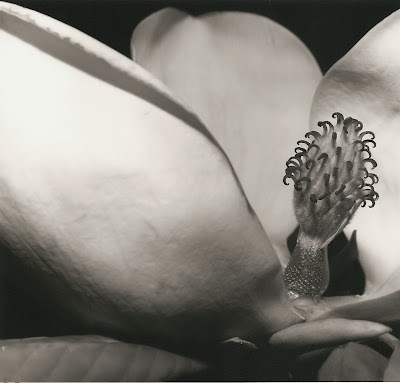 I've been studying these Magnolia flower photographs and I am thinking I may resort to cropping to improve the composition. To some photographers cropping is a sin. I agree to a degree that looking for "the picture in the picture" is sloppy but sometimes if you have a photographic opportunity you can't repeat and you are unsatisfied with the way you captured it you can try and salvage something from it. 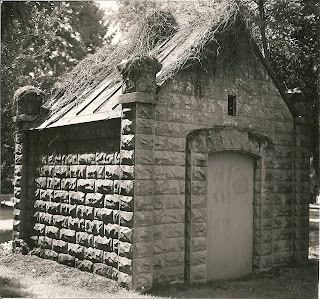 I am thinking that way about these pictures especially the ones done with 120 fine grain Agfa 25. I can improve the image a bit and not sacrifice anything other then about 25% of the picture that I think is unecessary. 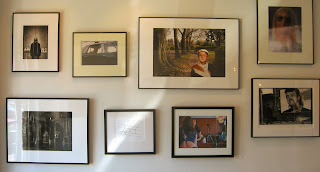 Today on my lunch hour I went across the bridge to check out the juried exhibit at Newspace. 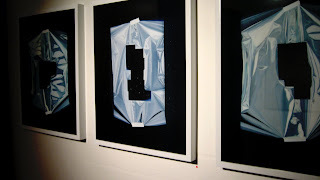 The Newspace annual juried exhibit was the first show I ever submitted work to and was the first time my work was officially rejected so it holds a special place in my heart. I didn't submit anything to the show this year and I certainly enjoyed the show more because I didn't bring to it the jaundiced eye of the rejected. The reviews that have been done of juried shows seem to always have a luke warm reaction from art critics though I am not real sure why that is. I am sure it is easier to write ones impressions of a single artist and his "current series" of work but I prefer the juried show I like the juxtaposition of work done in a variety of processes, styles and sizes. The Newspace juried show is also a contest in that a winner is selected and that person receives a cash prize and a solo show at the gallery in the future. This was this years winner Jessica Skloven of San Francisco. Her web site is here . 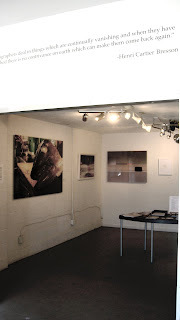 Here are a few more of the pictures in the show. The top one by Daniel Barron is disturbing. 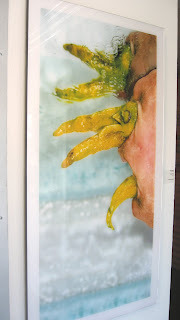 I feel like I am looking at a close up of a specimen from an alien autopsy. I liked the middle one but now that I look at it again I'm not sure anymore why. 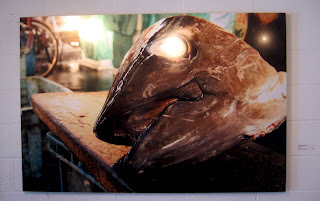 The fish head picture was huge. A funny thing happened yesterday while taking pictures. I went out on my lunch hour with my camera and no clear idea of where to go just an hour to do it in. I saw a Hawthorne Bus and decided to hop on and go check out the Newspace Juried Show. 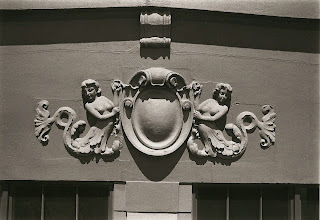 I was going across the Morrison Bridge and saw these concrete relief decorations on this old building that I had been wanting to photograph from the Morrison Bridge. I had my camera with me and the Juried Exhibit would be up through July so I changed my mind yet again and got off at the next stop. As I approached the bridge I realized this wasn't such a good idea there wasn't a cross walk to get across Grand or any safe way to access the walkway to the bridge at that point. The walkway is very narrow and puts you very close to the east bound traffic. I was committed though so I walked for a short distance to get a wonderful view of the decorations on the South side of the building. It was bright sun and I had on an Orange Filter and started taking quite a few pictures as the bridge shook beneath my feet every time a car or truck or very large truck zoomed past me only inches away. After shooting about 15 images I checked my apeture setting and it was f-4. F-4! bright sun, and ASA 100 film. Something was amiss. Using the standard "ASA rating convert to nearest shutter speed for apeture of f16 in full sun rule" I should have been getting a reading closer to f 8-11 at 125th of a second with the filter. I adjusted the apeture and shot a few more pictures closer to what I believed was the correct apeture and then decided it was time to get a bus back to work. I got back across Grand and realized I was close to Citizens Photo and I needed some photo chemicals and I still had a little time to kill. I went over and got my chemicals and while walking up to the cash register suddenly realized that perhaps my cameras meter was reading incorrectly because I needed new batteries. I couldn't remember though which battery the meter uses on the Nikkormat so I started to pull the battery out to avoid displaying my ignorance but a very helpful salesperson caught me and pretty much took over from there. He pulled out the battery and checked the voltage, .5 rather then 1.5 which would explain the overexposure. The old meters require a specific voltage to boost the sensitivity of the meter and give a accurate and consistent reading. If the voltage is too high it underexposes a bit, if the voltage is low it overexposes. 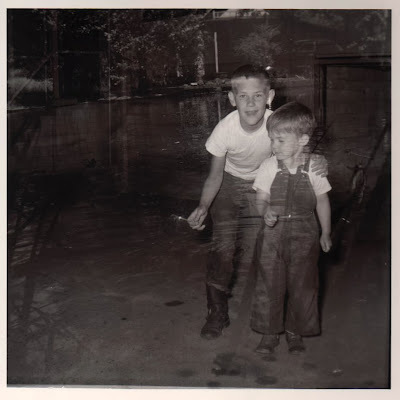 The cameras were designed to work with a 1.3 volt Mercury battery. 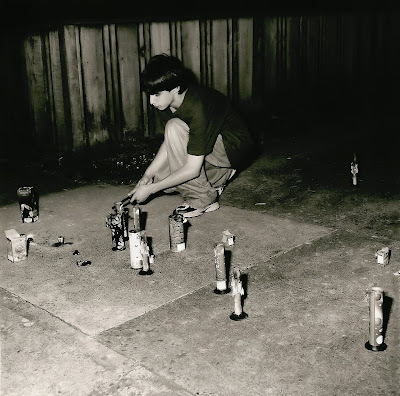 The old Mercury batteries held their voltage until they were exhausted but the newer batteries made with "more environmentally sensitive" material lose voltage over time and screw up the old meters that relied on a steady voltage level. So I replaced the batteries and when I got outside and checked the meter sure enough the reading was f16 at 125 of a second not f4. I had shot though quite a few pictures at the wrong setting and overexposed the film. So with another 15 pictures on the roll I am going to shoot the rest of the film at a lower ASA setting and purposely over expose and then pull the film in development. As I understand it I should shorten development by 1 minute for every stop of over exposure. Hopefully this will spare me having to go back and reshoot. So there is a little story about me and my attention deficit disorder and how it gets me in a bit of trouble from time to time as well as 10 minutes late. 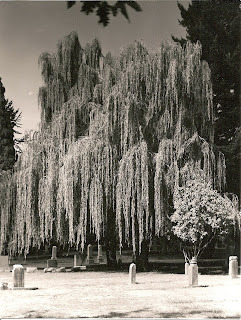 Here is a picture I took yesterday in Lone Fir Cemetery of a shadow. 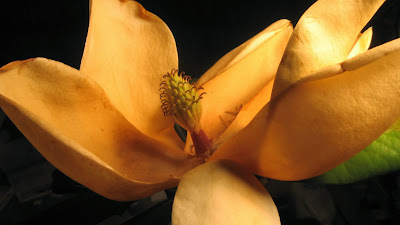 Two new photos of the Magnolia bloom I photographed last weekend. 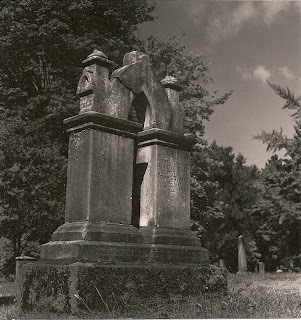 These were taken with my Mamiya C220 using Agfa 25 film and one printed on cold tone paper the other warm tone. When working with the cold tone papers I seem to prefer a higher contrast filter like 3-4 to get the result I am looking for with the warm tone paper I use a 1-2. Not sure why that is. I'm dissapointed with the batch of pictures from this roll but I still have one roll of 35mm Agfa 25 and my 4x5 sheet film yet to be developed. 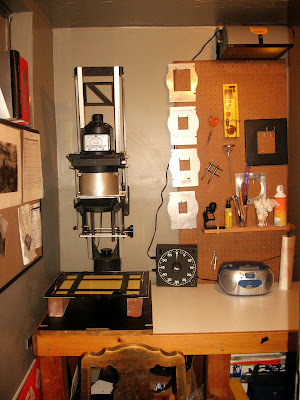 When I print 6x6 or 6x7 negatives I use a enlarger lens with 105mm focal length. I have one 105mm enlarger lens of dubious quality the other is a 105mm nikkor bellows lens that I can fit to the enlarger with a lens plate that has a nikon bayonet mount that I found on e-bay. This is the better option for quality work. I have two excellent el-nikkors in 50mm and 75 mm for working with 35mm, and a 135mm el-nikkor and Rodenstock 150mm for 4x5. Any journey begins with the first step. 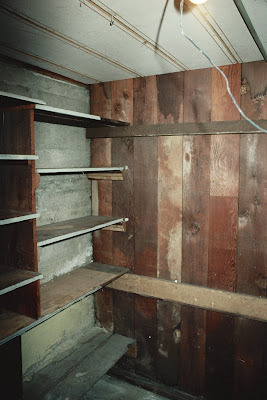 It's been 4 years now since I began the process of converting this moldy, dusty little corner of our basement in to my darkroom so that I could begin again practicing photography. I worked on it on weekends and in the evening after work. I had no idea what I was doing and it took me a month to build. To keep me inspired my guide was Ansel Adams in the form of his Basic Photo Series 1-5; (1)Camera and Lens, (2)The Negative, (3)The Print, (4)Natural Light Photography and (5)Artificial Light Photography. First published in the 1940's and still in print I cannot think of a better place to start ones photographic education. I highly recommend anyone who is considering the pursuit of photography (real or virtual) as an art form to start with reading at least the first in the series, Camera and Lens. One should own this book before one owns a camera. I only wish someone had introduced them to me 40 years ago when I first began. I am not one of those who feel they should cross themselves every time they invoke his name but few artists were as generous in sharing what they learned. Here were some of my first prints made from some of my first developed film. Jacob Kamm House in the Second Empire style, Water front restaurant Lucier in the Declining Empire style. Obviously I prefer the classical over the crapical but I take a little more pride in the waterfront picture. I aligned the corner of the building in the foreground with the condo in the background to fuse them photographically in to one shape. The bright light, faster film and wide angle lens gave me greater depth of field so both buildings are in focus which helped. 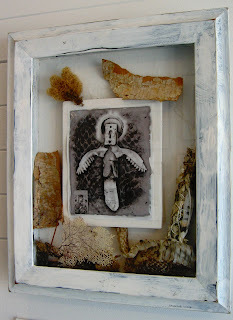 I had a lot of glass to introduce reflected imagery. The light in the waterfront picture was also more problematic then the Jacob Kamm House because it was bright contrasting sun from a cloudless sky versus flat lighting from an overcast sky. The buildings are shaded and I exposed for the shaded areas, the sidewalk outside of the shadow of the building was reflecting more light then the sky so it has to be burned in a little more to bring out some detail. I created a mask to dodge the buildings and allow an extra 20 seconds of exposure for the sky and sidewalk. I could have burned in the sidewalk an extra 5 seconds probably if I wanted to make the print a little better but the picture was hardly worth the effort. I also kind of like that the sidewalk is one zone darker then paper base just enough to show a little detail and in a brighter zone then the the sky. I wish there had been some clouds in the sky though and the clouds could have matched the sidewalk. 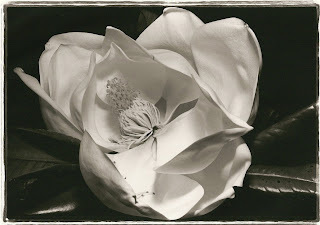 As Ansel Adams said "The Negative is the score, the print is the Performance." 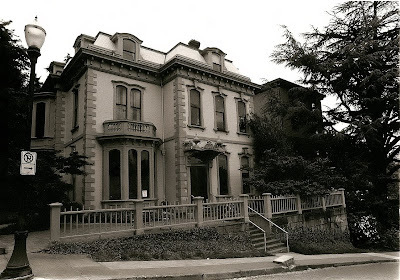 I hate the flat light of the Kamm House picture. 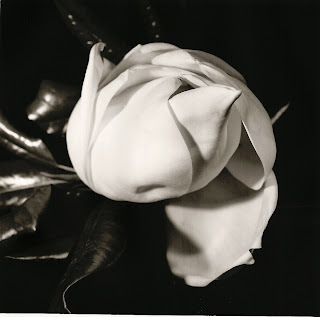 The first Magnolia flower I tried to photograph done with my Mamiya C220, Agfa 25 film. 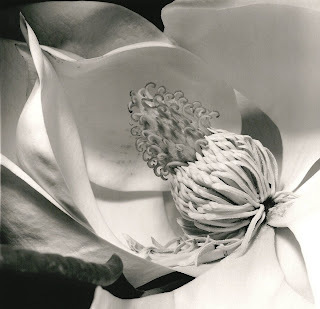 This is one of the first pictures of the Magnolia flower I photographed on Friday using Agfa 100, 35mm. 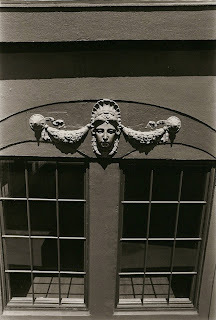 This was taken with a Nikkormat using a 55mm 3.5 Micro-Nikkor lens. I printed this yesterday on both gloss and semi-matt warm tone papers. I still have a roll of 120 and another roll of 35mm Agfa 25 and several sheets of 4x5 film that I used as the flower opened up. 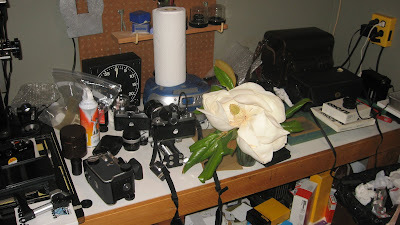 I arose early so I could cut that Magnolia grandiflora flower and set up my cameras while it was still opening up and nice and white. It lasted most of the day slowly opening up and perfuming my "studio" with its wonderful fragrance. 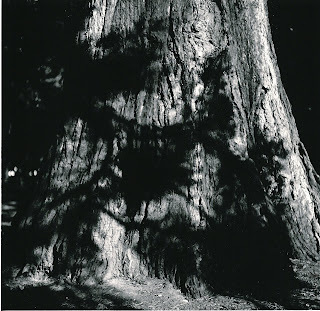 I photographed it in 35mm color,Agfa 25 and 100, 120mm 6x6 in Agfa 25, and 4x5 with Ilford 100. That is pretty much what I did all day. Tomorrow I can develop some of the film and see what I have. Fourth of July weekend. Started with a bit of a bang early this morning with an incredible electrical storm. 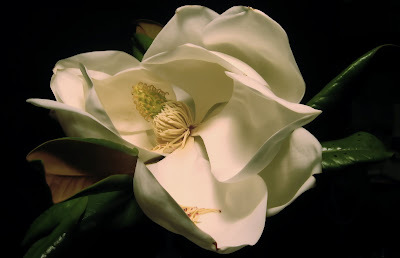 I spied another fresh magnolia I can grab and this time I'll start photographing first thing tomorrow morning after I cut it. 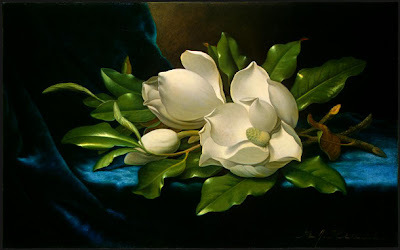 I have been looking for a big Magnolia grandiflora to photograph in hopes of creating something like this wonderful Martin Johnson Heade illustration. I noticed one near my house just starting to open up yesterday evening in a convenient place for plucking. I went back later in the evening and cut it and brought it home hoping it would last long enough for me to photograph it after I got home from work today. I kept it nice and cool but it went from white to a pleasant shade of brown by the time I got home. 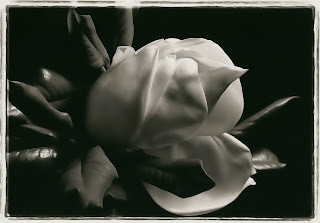 While setting it up to photograph the petals started dropping off so it wasn't what I had hoped for but I took some pictures anyway using a 6x6 format with Agfa 25 film. 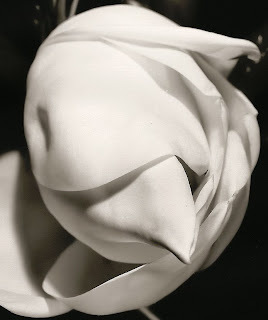 This is a digital picture taken of the flower I was trying to photograph. This weekend I'll develop the film and hopefully I'll get something nice. 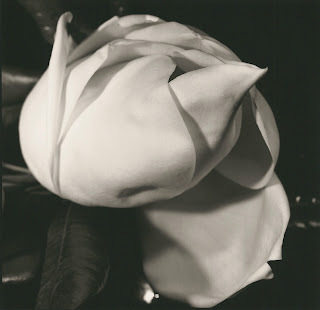 At least the flower will come out white with black and white film.